In our demo-centers we are able to simulate the solution in 3D, allowing to evaluate all the critical issues and develop in-depth studies of feasibility, production cycles and timing. 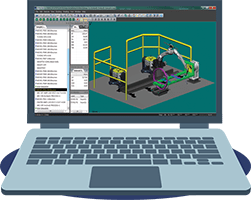 Thanks to Panasonic DTPS simulation software, we can simulate both accessibility and welding cycles by importing the pieces into different 3D formats. With simple instructions the DTPS is able to simulate with realistic parameters. Studying and manufacturing welding jigs to be integrated into our machines. Depending on the size of the pieces, the complexity, the quantities and the technical specifications required by its customers, we can produce manual, pneumatic or hydraulic jigs, complete with sensors and machine interfacing. A team of expert and constantly updated technicians follow our customers through telephone assistance services or timely intervention in the field. 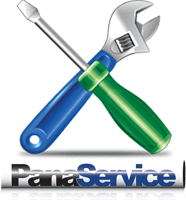 For our machines we promote Panaservice contracts, a clear and effective formula for Post-Warranty Technical Assistance on your Panasonic robots or automatic machine. With a simple scheduled technical assistance contract, we can guarantee the efficient maintenance of your Panasonic robot thus preventing as much as possible stops and consequent production losses. By adhering to “PANASERVICE” we are committed to offering you free technical and commercial assistance services.